There’s a power in using our privilege as American Jews to stand for peace and justice. I’ve always wondered if a day would come when there would be a cause so important that I would be willing to get arrested for standing up for what I believe in. That day came on Friday, July 15, when I was in the West Bank city of Hebron protesting the Israeli occupation, alongside dozens of other North American and European Jews. But it didn’t turn out the way I’d expected. 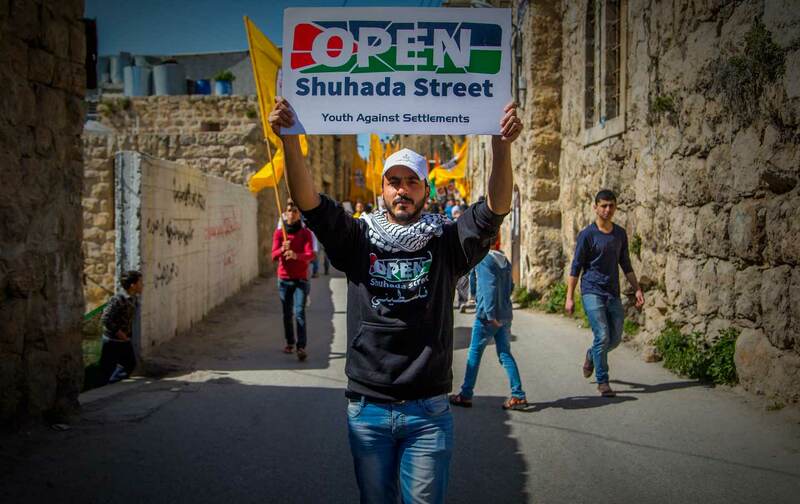 I was in Hebron with the organization I direct, the Center for Jewish Nonviolence, calling for an end to the occupation alongside our Palestinian and Israeli partners, Youth Against Settlements and All That’s Left. We’d been invited by Jawad Abu Aisha, a Palestinian owner of a shut-down factory, to help transform his property into a community cinema in a city without a single movie theater. Hebron is the West Bank city where the repression of the occupation is most vivid. Hebron is the city in the West Bank where the repression of the occupation is most vivid, thanks to the presence of some 800 settlers who have taken up residence—with the blessing and support of the Israeli government—among a Palestinian population of 215,000. Settlers and soldiers serve as agents of the occupation throughout the West Bank, not just in Hebron, and the occupation reaches into the daily lives of all Palestinians, from arbitrary roadblocks to water-use restrictions and home demolitions. But Palestinians who live in Hebron are subjected to a particularly extreme form of humiliation and discrimination. In Hebron, Palestinians are forced to walk on segregated side streets while settlers saunter down what used to be the Palestinian main street, slinging guns on their hips, throwing trash on the Palestinian market place, and taunting Palestinian children with catcalls and disparaging remarks that compare them to monkeys. I don’t like going to Hebron. I’ve been going there for ten years, and it’s the only place in the world that makes me feel ashamed to be Jewish, thanks to the horrific behavior of settlers who claim to represent Jewish values. But this summer, I had the opportunity to show that Judaism is not about settlers, soldiers, or occupation. Not long after our group of volunteers arrived in Hebron, the Israeli army showed up and told us we had to leave. We hadn’t done anything wrong, but we had to leave anyway. Why? The army was suddenly declaring Abu Aisha’s building a “closed military zone.” It didn’t matter that he was the owner of the building and had the deed to his property. It didn’t matter that he had personally invited us to work on his land. What mattered was that he was Palestinian. I grew up with stories of Rosa Parks and Nelson Mandela, and I know there comes a time when you have to make a choice. I grew up with stories of Rosa Parks and Nelson Mandela, and I know that there comes a time in life when you have to make a choice. When the laws of a nation are themselves unlawful because they discriminate against another people—as do the laws of the occupation. When there is no legal recourse for an entire population to seek justice—as is the case in the occupied Palestinian territories. And when you’ve tried every other avenue available, as I have, from education to advocacy, and change still does not come, it is time to engage in nonviolent civil disobedience, because to act in accordance with unjust laws becomes, in and of itself, a travesty. Closed military zones are just one example of Israel’s discriminatory laws that subject the people living under them to no legal recourse. Entirely at their discretion, the Israeli army can shut down any area of land, for any length of time, for any reason. A closed military zone then gives the army the right to detain or arrest anyone who refuses to leave. The army frequently declares entire cities and villages closed military zones when Palestinian nonviolent protests take place, including gatherings like ours that simply engage in home-improvement-style construction on a Palestinian-owned building. We knew in advance that it was likely the army would declare Abu Aisha’s property a closed military zone after we arrived, because even small acts of decency are considered a threat to the Israeli occupation forces. There would be a choice to make: Obey the military order and leave, or stand up for justice and peace. We chose to stand up for peace and justice. Or rather, we chose to sit for peace and justice. Holding hands and singing in Hebrew “lo yisa goy el goy herev” (nation shall not lift up sword against nation), we sat down on the ground, legs crossed, and said to the Israeli army: We shall not be moved. We assumed they would arrest us. That’s what the Israeli army and police does to Palestinians, Israeli Jews, and other, non-Jewish foreign nationals who refuse to obey the capricious and discriminatory laws of occupation. In that moment, we were willing to be arrested because we did not want to comply with the unjust and discriminatory laws of the occupation. And indeed, they did take seven of our Palestinian partners and six of our Israeli Jewish partners; earlier in the day, Israeli security officials had already stopped and turned back a busload of additional Israeli activists, many of them affiliated with the longtime activist group Ta’ayush. But the American Jews? Not a one of us was arrested, even though we participated in the exact same act of resisting the military order as the Israelis and Palestinians. The entire premise of the Center for Jewish Nonviolence is that there’s power in using our privilege as Jews from the Diaspora to resist the occupation in solidarity with Palestinian and Israeli nonviolent activists. But I didn’t know just how powerful it was until this summer in Hebron, when the Israeli police went to great lengths not to arrest those of us who were American, European, and Australian Jews. The State of Israel has always been dependent on support from Jews in the Diaspora, from its founding to today. American Jews donate close to $2 billion a year to Israel. But it’s not just the money that the Israeli government is dependent on. Prime Minister Benjamin Netanyahu claims that he represents all Jews, and he attempts to equate all criticism of Israeli policy as anti-Semitism. By showing up on the ground to protest the Israeli occupation, we can discredit both of these fallacies at the same time. Jews from the Diaspora have a unique and powerful tool to use in the form of nonviolent activism, since we can simultaneously demonstrate that Netanyahu does not represent us and show that working for peace and justice are inherently Jewish values, that occupation is the aberration. 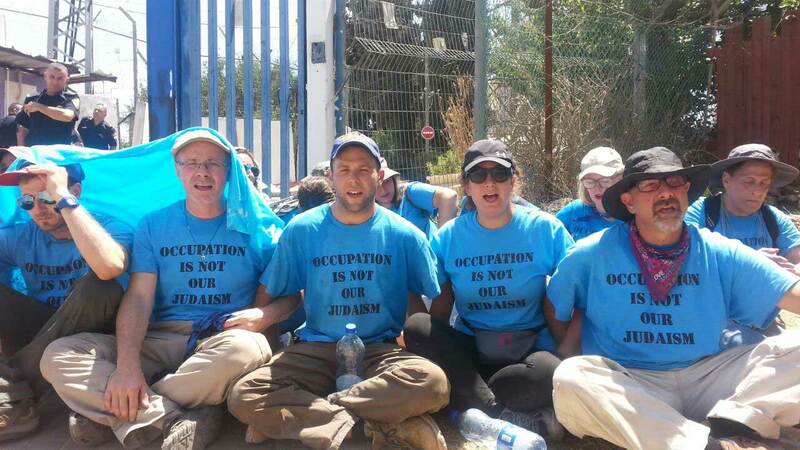 Our presence as Diaspora Jews protesting the occupation puts the Israeli government in a bind: They don’t want to let us do peace activism, because Israeli policy in the territories is a policy of oppression—why else would they prevent us from building a movie theater? At the same time, if Israeli police or army arrest Diaspora Jews for doing peace activism, it disproves Netanyahu’s claim that he represents all Jews; even more, it makes it impossible for the Israeli government to claim that it is a seeker of peace, when in fact, it is the perpetrator of occupation. That’s why they didn’t want to arrest us. And that’s why I’m going back. Ilana SumkaIlana Sumka is the founder and executive director of the Center for Jewish Nonviolence. She previously served as the Jerusalem director of Encounter, and has twenty years of organizing and activism experience in the United States and Israel.